Few dozen participants gathered in front of the Russian embassy. Syrian students rallied before the Russian Embassy in the Indian capital on Sunday, in support of the Russian Air attacks against the Islamic State in Syria. 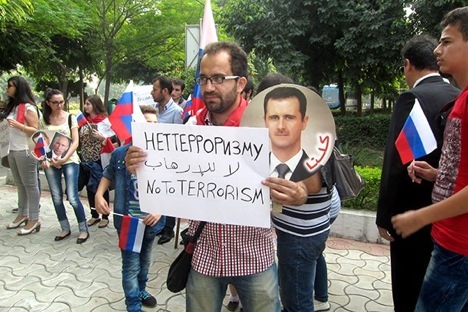 A rally in support of Russia’s aerial attacks against terrorists in Syria was held by Syrian students in front of the Russian Embassy in New Delhi on Sunday. “Today, Syrian students, who are studying at universities in New Delhi, came to thank Russia for its efficient operations, which its aerospace forces have been carrying out in Syria against terrorists. We very much appreciate the Russian position and assistance,” said Mohammed al-Ghazzawi, adviser at the Syrian Embassy in Indian. Not only students, even children and relatives of students were among the few dozen participants gathered in front of the embassy. “We did not come here to make a demonstration, but to express our gratitude to Russia for its help and support of the Syrian military that are fighting terrorism,” said Zulfiqar Abbas, a student at a university in Delhi. His compatriot Mohamed Tamam studies linguistics at the Jawaharlal Nehru University. He also came to thank Russia for its fight against the Islamic State’s terrorists, who are enemies of the world. Sergey Karmalito, senior counselor at the Russian Embassy, received the student delegation. “We are fighting a common enemy – international terrorism. And we know how much grief, death and other problems it has brought to the people of Syria and other neighboring countries. In Syria, Russia is acting on the basis of an invitation from the legitimate government of the country, and in accordance with international law. If we fail to cope with this threat now, it will spread to other countries, including Central Asia,” Karmalito said, thanking the Syrian students for showing their solidarity with Russia. Russian Aerospace Forces, at the request of the Syrian government, launched an operation to destroy IS positions in Syria at the end of September. The attacks have destroyed a significant number of fortified points and warehouses of these IS terrorists.